Yesterday was St. Patrick’s Day and we decided to cook with that theme in mind. We wanted to play with the beef and cabbage concept and in turn create a unique dish that works for St. Patty’s day (or any other day). This recipe is a form of our Pantry Night concept and (as our recipes so often do) has a good back story. 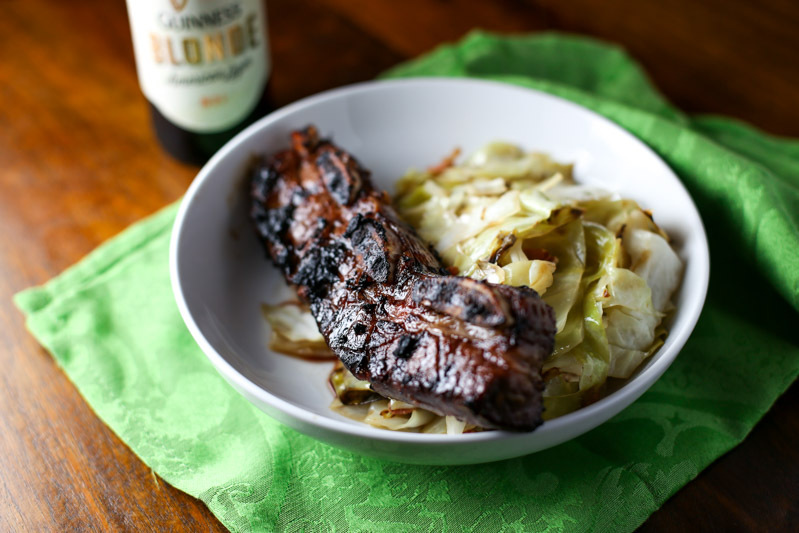 Now get yourself a favorite beverage, sit back, and enjoy our recipe for Guinness Marinated Beef Short Ribs with a side of braised cabbage. Our story starts a couple of weeks ago when we made the Kalbi BBQ recipe. Shopping for the ingredients for that recipe proved to be challenging and the first attempt brought home some Beef Short Ribs that were not the right cut for Kalbi. As a result we put those ribs in the freezer to use at a later date. When prepping for the Blog menu this week we decided to use the Beef Short Ribs we had on hand. This became the foundation of our St. Patrick’s Day themed menu. For the marinade we used 1 can of Stout, brown sugar, onion, garlic, and soy sauce. Mix together all the ingredients and place it in a large Ziploc bag with the Beef Short Ribs. Let this sit overnight. For the cabbage we did something very simple. Half a head of green cabbage, 3 slices of thick cut bacon, 1 cup of chicken stock, and 1/8 cup of white wine vinegar and 1 Tablespoon of coarse mustard went in to this recipe. To prep the cabbage we cooked the bacon over medium heat until crispy. We removed all but 1 Tablespoon of the bacon fat from the skillet. We cut the cabbage into thick strips and added it to the bacon fat in the pan cooking over medium high heat for 5 minutes. Then we added the chicken stock and vinegar to the pan letting the cabbage cook until tender. Once it was tender, we stirred in the coarse mustard. While the cabbage was cooking we took the beef out of the marinade to let it come up to room temperature and set the Big Green Egg for direct grilling at 400°. Once the ribs were at room temp and the Egg was set to 400° we were ready to get grill! We cooked these bad boys for 5 minutes per side, then let them rest for 5 minutes and served over the cabbage! This recipe for Guinness Marinated Beef Short Ribs is the perfect meal for St. Patrick's Day! Add the cabbage strips to the bacon pan and cook over medium-high heat for about 5 minutes. Add 1 cup of the chicken stock and the ¼ cup of vinegar to the pan. Let the cabbage cook in the liquid until tender, adding more chicken stock as needed. When the cabbage is tender, remove from the heat and stir in the coarse mustard.